☰ Blue Grass Staking Services Inc.
Now Available! Bluegrass Staking on your mobile device or tablet! Bluegrass Staking Service was established in 1984 with the Standardbred owner and trainer in mind. Through our dedication to providing the best possible service, we have become the largest staking service in the world. Registering your horse with Bluegrass Staking Service gives you the peace of mind of knowing that your stakes payments will be handled competently and professionally ensuring the sustained value of your stable. 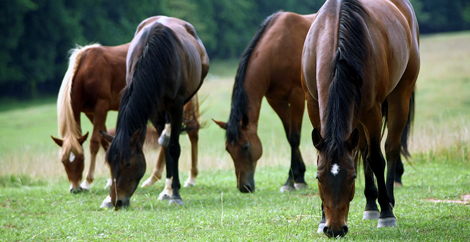 Whether you have racing stock or a breeding farm, Bluegrass Staking Service will attend to the details. The service is operated by Teena and Mike Freibert. They and their competent staff represent over a century of experience in everything from pedigree research to racehorse training. This experience allows them to understand your needs and take a personal interest in your success. All the information provided through Bluegrass Staking Service, especially through the touch of a finger on the iPad or iPhone, makes keeping track of things a lot easier. Good Job! I use Bluegrass Staking Service and love it! Bluegrass is the most technologically advanced service I've seen. The service is great and now with the new staking app I can access my stakes anytime, anywhere from any of my mobile devices. This comes in very handy while traveling or just the times you don’t have your staking sheet handy. The Who’s Eligible page is a great addition to the app. I highly recommend Bluegrass Staking. I’ve used Bluegrass for many years. The online service is great. It’s user friendly and getting better every year. Mike, Teena and the staff are efficient and do everything possible to help make staking an easy job. My job is so much easier using Bluegrass in so many ways that I can’t even begin to tell everything they do. I use their service for all my clients and horses. True professionals that have evolved with technology and continue to do so. Use their mobile app and visit their website to find out for yourself.